For your viewing enjoyment... our Junior & Senior individual player highlight videos. The Gators dramatic game-tying "hook and lateral" won the ESPN "Greatest Play of the Month" by popular vote, topping the NFL record 109 yard missed FG return 44 percent to 42 percent in a nationwide poll - results were announced Friday, November 30! Gatewayâ€™s Cameron Saddler has set the date for his official announcement for selecting his college of choice. The date will be Wednesday December 5th at the Gateway LGI at 6pm. Gateway Senior Robbie Wratcher has signed a National Letter of Intent to play baseball for Youngstown State University. Robbie is a two-year letter winner in baseball and plays centerfield. He was voted the Gators MVP last season, leading the team in batting average and stolen bases. Robbie has also played varsity football since his freshman year and has earned four letters. He is the second Gator in the last few years to earn an athletic scholarship at Youngstown State, following Mike Barlak (class of 2004) who is currently on the football team. Rob is the first player recruited by newly hired Youngstown State baseball coach Rich Pasquale. The Penguins play in the Horizon Conference of the NCAA Division I. The WPIAL Class AAAA football championship was so good that FSN Pittsburgh television is giving fans an opportunity to watch it again. FSN Pittsburgh aired the Central Catholic-Gateway game live Friday night and will show it again Wednesday at 7:30 p.m. Central Catholic won the title with a thrilling 35-34 overtime victory. The contest is being called one of the greatest championship games in WPIAL history. Gateway fell behind, 28-13, with 1:02 left before coming back to force overtime. The Gators were defeated 35-34 in overtime by Pittsburgh Central Catholic. Congratulations to the Gateway Gators players on a most memorable season. The Gators successfully defended a 2 point conversion attempt by QB Greco and upset the #2 ranked North Allegheny Tigers at the Wolvarena on Friday night. The Gators were trailing 21-7 with a little over 8 minutes left in the game and stormed back to tie the game with 1:00 left on the clock. The Gators are now on the road to Heinz and will play Pittsburgh Central Catholic next Friday in the AAAA Championship game. Trailing by 14 points early in the fourth quarter, the Gateway Gators battled back to tie this contest at 21 with 1:00 remaining, and then held off the Tigers in overtime to advance to Heinz Field with a 28-27 win. North Allegheny struck first with a big play, a 74-yard TD pass from QB Mike Locke to WR Brian Austin with 3:25 left in the first quarter. Austin would leave the game after being injured on a kickoff late in the first quarter. The Gators would tie things up in the second quarter, with an impressive 8 play 98-yard drive that featured Cameron Saddler. Saddler carried the ball ever play on the drive, which included a 15-face mask against the Tigers. Saddler carried the ball on 17 consecutive plays in the first half. NA had the answer in Carl DeCiantis. DeCiantis capped the ensuing drive with a 4-yard touchdown run which gave North Allegheny a 14-7 lead at halftime. DeCiantis, who finished the game with 103-yards on 20 carries, had tallied a touchdown in every game this season for North Allegheny. The Tigers would capitalize on a fourth Gator turnover, when Alex Calder stole the ball from Leon Green at the Gateway 10-yard line. Two plays later, Locke would find Geoff Greco with a 10-yard scoring strike, and 5-yards into the fourth quarter, the Tigers lead 21-7. Thatâ€™s when the comeback began. Halfway through the quarter, Green capped of a 59-yard drive with a 6-yard run, after the Tigers chose to go for it on fourth down instead of punting. After a Greco punt resulted in a touchback, the Gators started at their own 20-yard line with 6:20 left on the clock. Gateway was faced with a 4th & 9 with 2:20 remaining, when a pass interference call against NA gave the Gators a first down at the Tiger 49-yard line. On third and 11, sophomore quarterback Rob Kalkstein ran for a crucial first down. Kalkstein then hit Jonathon Pryor with a 27 pass to the Tiger 12-yard line. Saddler, who left the drive early with leg cramps, returned and ran for 4-yards and capped off the drive with an 8-yard run with a minute left. Ryan Lichtenstein nailed the extra point and the game was tied at 21-21. NA would drive near mid-field before time ran out in regulation. Greco is stopped! View from the NA sideline. The Gators got their first victory against USC in over 33 years Friday night in a come-from-behind 32-20 game. The Gators rolled off 26 points in 5 minutes late in the 3rd quarter into the 4th quarter. The Gators will take on 2006 PIAA-AAAA Champion Upper St. Clair in only their second matchup in over 3 decades. 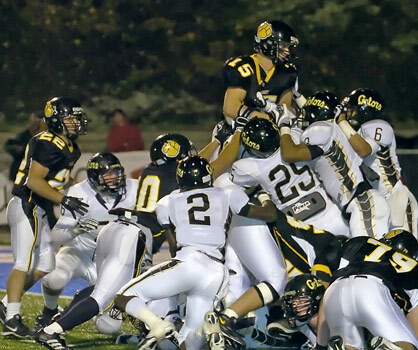 Despite being two of the most successful WPIAL programs, these two teams rarely matchup. The last two matchups - 1988 - a 21-0 playoff win by USC, and the 1974 WPIAL Championship game that ended in a 6-6 tie were the two previous meetings in over 30 years. The game will take place at NORTH ALLEGHENY on Friday night. The Gators defeated Penn-Trafford on Friday night to advance to the quarterfinals against 2006 PIAA AAAA Champion Upper Saint Clair. Video coming later this week. See the NEWS tab for the latest articles. The Gators will head to Heinz field today on their quest for the WPIAL AAAA Championship. Television: ALL 4 GAMES will be live (and also in High-Def) on Fox Sports Pittsburgh. For those of you with DirecTV, see channels 628 and 628-1. GatewayGators.com will be with the Gators all day long and will have behind-the-scenes photos and video. We are on a RECORD BREAKING pace for ticket presales... COME AND SUPPORT YOUR GATORS! There are MANY planned pregame tailgate parties going on in the main parking lot of Heinz stadium... arrive early and look for BLACK & GOLD - then go and cheer on your Gators! The Gators put on a clinic against Kiski last night rolling to a 42-0 halftime lead that expanded to 56-0 1:20 into the 2nd half. Gateway intercepted 4 Josh Vick passes and returned two of those for TD's. Defensive play of the game. In the 1st quarter, with the Gators up 14-0, Kiski had 4th and 3 INCHES to go on their OWN 30 yard line. Kiski called a timeout to talk it over and decided to go for it. Kiski opted to pass and upon dropping back and seeing no receivers open, QB Josh Vick attempted to scramble for the 1st down - until he was tackled short by #28 Eric Livsey. The Gators then took about 1 minute to make the score 21-0. The Gators raced to a 50-0 halftime lead before a nearly empty Fox Chapel stadium on Friday night and cruised with subs in the game the entire second half. Cam Saddler score on punt returns of 77 and 75 yards and on a 69-yard run, as the visiting Gators rolled to a Big East triumph. Saddler gained 151 yards on seven carries for Gateway, (7-1, 4-0), which has won seven in a row and is No. 3 in the WPIAL. Six Gateway players scored touchdowns against the Foxes (3-5, 1-3). The Gators got their first mercy rule win on Friday night by jumping out to a 45-0 3rd quarter lead on their rival Indians. In the 1st quarter, the Gators held PH to -3 yards rushing and about 30 yards passing and entered halftime with a 31-0 lead. See the NEWS channel above for articles on the game. The Gators will take on neighbor P-T in the 1st round this Friday at Antimarino Stadium. 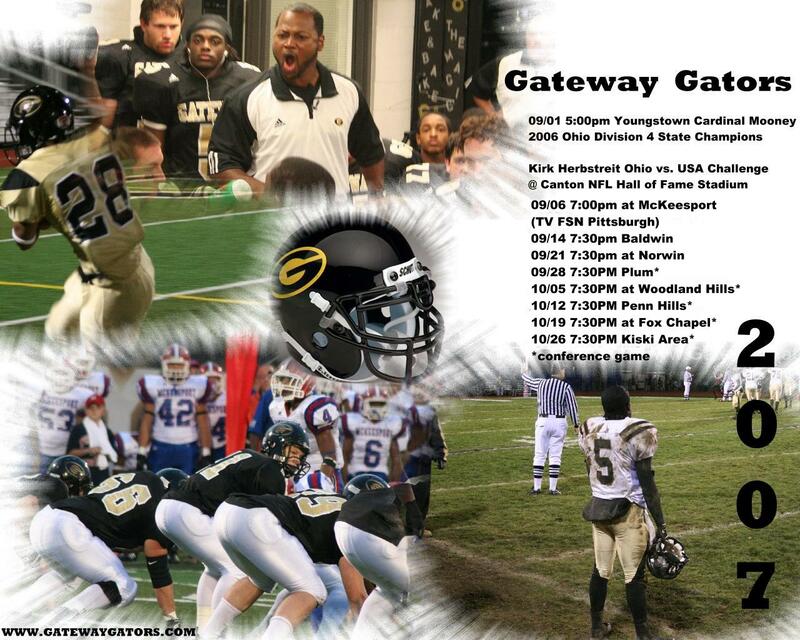 Gateway is 2-6 all-time against their neighbor Penn-Trafford and has won the last two meetings. 2003 W 45 14 9-2 Jai Wilson scores 4 TD's and accounts for 300+ yards in total offense. Mortty Ivy passed for 288 yards, and Justin King rushed for 124. The Gators picked up their first ever win at the Wolvarena (dating back to when W.H. started play in 1987) on Friday night in a 38-8 victory. The Gators let at halftime by the score of 17-0. Leon Green scored two touchdowns, on a 55-yard pass from Robert Kalkstein and an 11-yard run, and Cam Saddler had two 2-yard scoring runs for the Gators. Green had three catches for 81 yards, Corey Brown three for 93, and Kalkstein was 7 of 15 for 160 yards. Isaac McKenzie ran 3 yards for a score for the Wolverines (1-5, 1-1). Teammate Joe Shaffo was 14 of 28 for 163 yards, but was intercepted twice. The Gators, who struggled to move the ball consistently on offense, relied on their defense to stop the visiting Mustangs - and topped Plum 14-7 behind two Cameron Saddler TD runs inside the 5 yard line. The Gators will look to open section play on a positive note this Friday when neighbor Plum visits Antimarino Stadium at 7:30pm. Come on out and support your Gators! In a classic "last team with the ball - wins" game - the Gators (3-1) survived a back and forth game against Norwin (2-2) on a 70 yard kickoff return for a TD by Brian Williams with 14.1 seconds left in the game. The game also featured THREE kickoff returns for TD's by the Gators - two by Cameron Saddler and the game winner by Brian Williams. Norwin scores + XP to make the score 29-28 with about 9 minutes left in the 4th quarter. Norwin starts a drive... They overcome a 4th and 9 for first down. Cameron Saddler is then whistled for a pass interference call at the 50 - on a pass that literally hit him in the numbers - and that moved the ball to the Gateway 35. The Gators again force Norwin into a 4th & 12, but again Norwin makes the first down and goes all the way to the Gators 12. A few plays later, Norwin's QB throws to the back of the endzone and the Norwin receiver gets a TD - even though replays showed he did not land in bounds. Score is now 36-31 Norwin with 34 seconds remaining. After Gateway performed a squib kick back to Norwin - and the Norwin timekeeper only ran off .8 seconds for the kickoff, Norwin was able to try three more plays to try and win the game but ran out of time. NOTE: Due to technical issues, sideline highlights are not available for this game. Gateway wide receiver Jon Pryor, who verbally committed to Eastern Michigan on Friday, scored two touchdowns to lead the No. 2 Gators to a non-conference victory over Baldwin (1-2). Pryor caught a 4-yard pass from quarterback Robbie Kalkstein and also returned a punt 59 yards for another score. Eric Livsey added two touchdowns for Gateway (2-1) on runs of 18 and 7 yards. He carried the ball 10 times for 96 yards. Leon Green, who scored on a 15-yard run, led Gateway in rushing with 106 yards. Jordan Joyce paced Baldwin with 63 yards rushing on 13 carries. He threw a 5-yard pass for a touchdown to Ian Wild for Baldwin's lone score. Baldwin - who defeated Woodland Hills at the Wolverena on Friday in overtime - will visit Gateway this Friday. Baldwin, which sports a new head coach (Dan Pallante) and a McKeesport-like "Triple Option" offense, will take on the Gators in their 4th head-to-head matchup since 1980. The teams have played three times: 1999 (Gators 34-14), 2002 playoffs (Gators 28-20), and 2006 (Gators 40-3). Recap from the Baldwin/WH game: Baldwin 14, Woodland Hills 7. Baldwin's QB Jeff Joyce scored on a 2-yard run in overtime, and the visiting Highlanders held on to defeat the Wolverines for the first time in 10 meetings. Baldwin (1-1), which gained all of its 143 yards on the ground, went ahead, 7-0, in the first quarter on Matt Perella's 2-yard bolt. Woodland Hills tied the game with 6:05 left on a 23 yard TD pass. »2005 and 2006 Gateway Football Highlights DVD sets are now available! The Gators played with a lot of heart and intensity on only 5 days practice - and controlled McKeesport's Flexbone offense by shutting out the Tigers for the first 45 minutes of the game in route to a 17-6 victory. Leon Green made his debut at QB and rushed for 60+ yards in the game - while also making the gamebreaking play - a 97 yard INT return for a TD to make the halftime score 17-0. Brian Williams scored the first Gators' TD on a 38 yard run early in the 2nd quarter. The Gators will look to rebound from their loss at Canton and take on the McKeesport Tigers this Thursday night in the FSN High School Football game of the week. McKeesport Mercy-Ruled North Hills on Friday 36-14. The Tigers piled up a lead of 36-0 in the 2nd Half before subbing their starters... and piled up in excess of 350 yards rushing - with only one pass attempt in classic McKeesport fashion. Ohio football power Mooney ran by the Gators on Saturday night at Canton, Ohio, by the score of 27-6. The Gators trailed 20-6 at halftime before an early score in the 3rd quarter sealed the victory for the Cardinals, who put on an impressive football fundamentals clinic. The Gators could not overcome 5 turnovers, including the first one of the game in the 2nd quarter - a blown call by the linesman who gave Mooney LB Zordich an interception at the Gators 8 - after he clearly caught the ball out of bounds. One play later Zordich scored and with the extra point Mooney led 7-0 and never looked back. Gateway RB Cameron Saddler scored the only TD for the Gators but was unable to play in the 2nd half due to an injury. The Gators had 3 INT's and 2 fumbles and that pretty much turned the tide in favor of Mooney who were able to turn several of those turnovers into points. We are pleased to launch the 4th revision of the GatewayGators.com web site - the 5th year we have been online (since 2003). 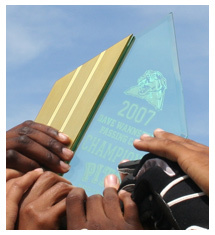 We'll be adding to the site including 2007 previews & recaps, photos, video and much more as the season goes on. 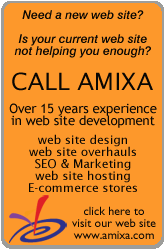 We'd like to hear your comments on our new site! With the launch of the new site, popular content including news articles, photos, and guestbook have been moved to their own tabs --- see right above this text area. Click the tab to see that content. This top-notch matchup of Ohio football power Cardinal Mooney versus our Gators will be played this Saturday, September 1, 2007 at Canton, OH's Faucett Stadium - Home of the NFL Hall of Fame. Mooney has already played its first game - on Friday, August 24 against D1 (Largest class) power Mentor. Mooney - a D4 school in Ohio, with ~180 boys and over 80 players on the team, played Mentor, a D1 (largest class) team that was the state-runner-up in 2006 (Ohio opens their season one week ahead of the PIAA). Mentor is a pass-happy team with a highly regarded QB, but they don't have a strong rushing attack. The game was played at Youngstown State University. Mooney led 14-10 with under 5 minutes left in the 4th quarter when their QB took a 70 yard bootleg run to cap off the scoring at 21-10 for the Mooney win. Mooney finished with 364 yards rushing and managed to beat the biggest school in Ohio despite throwing just one pass. Mentor had 280 total yards - 191 in the air and 89 rushing. Watch the video highlights here. The Gateway - Mooney matchup has received national attention and may be the highest attended and most intriguing matchup of the day at the Kirk Herbstreit Challenge in Canton. Cardinal Mooney has won Six Division 4 State Titles - including a 14-0 undefeated season last year. The Gators are seeking their first championship since 1986 - the year Head Coach Terry Smith quarterbacked the team to a 7-6 victory over then #1 nationally ranked Pittsburgh North Hills by the score of 7-6. Cardinal Mooney has four NCAA Division 1 recruits: S/QB Dan McCarthy (Notre Dame), RB/LB Brandon Beachum, Penn State-bound LB/FB Michael Zordich, and OL/DL John Simon. The Gators counter with nine NCAA Division 1 offered players, LB/FB Shayne Hale, RB/CB/KR/PR Cameron Saddler, DB/WR Leon Green, RB/DB Eric Livsey, OL/DL Eric Warning, WR/CB Jon Pryor, OL/DL Bill Kemp, WR/DB Corey Brown (Junior) and LB/TE Dorian Bell (Junior). Varsity against varsity, Gateway 2-0. Mixed 1/2 teams, 1-1. Scoring: Cameron Saddler - 60 yard TD run on a broken play - ran into the line, no room, bounced back into the backfield, ran to the wide side of the field and outraced Bethel to the end zone. TD Pass from Kalkstein to Brian Williams ~45 yards. 60+ yard run for a TD by Eric Livsey. The Gators varsity squad blanked Butler 8-0. Rushing: 3 TD's - Cameron Saddler (2), Eric Livsey. Passing: R. Kalkstein 3 TD passes to: Pryor, Saddler, Brown. Defensive INT returns for TD: Pryor (~65 yards), Leon Green (35 yards). 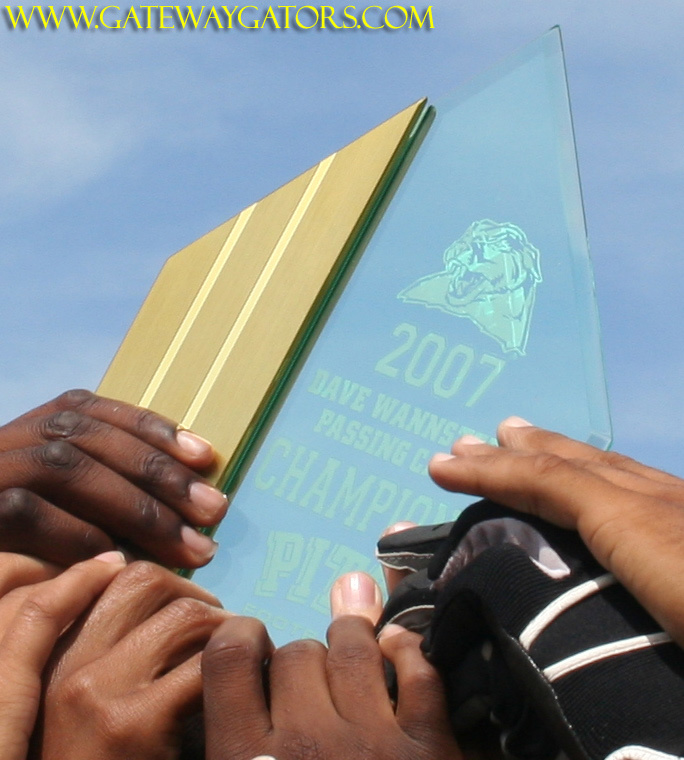 The Gators went a perfect 5-0 at the Akron 7-on-7 Tourney on Saturday, July 28 - including two victories over Cleveland Glenville. The Gators took on the Wash High Prexies and the Derry Trojans on Tuesday, July 10 at Washington, PA.
Special thanks to Larry G. for the creation of these 2007 Gateway Football desktop wallpapers.. 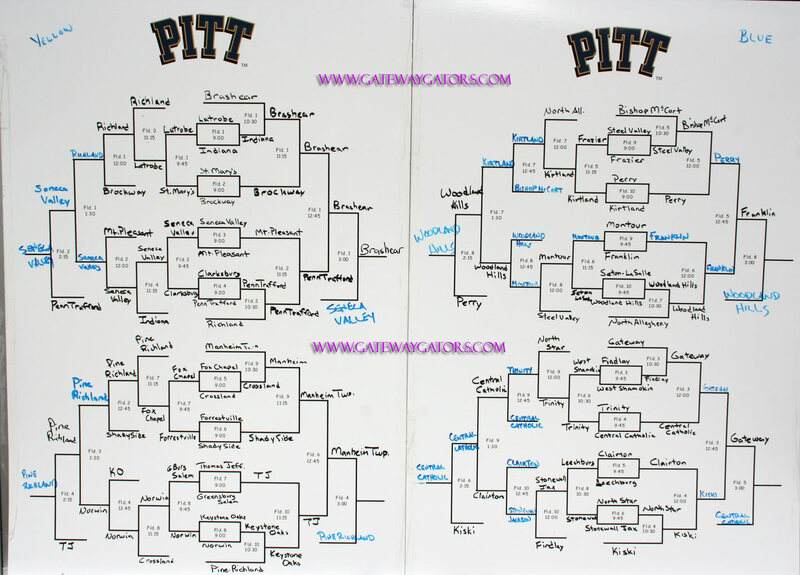 The Gators were one of the four tournament champions at Pitt's 2007 7-on-7 tournament. The Gators finished with a record of 9-0, going 5-0 the first day and receiving the 1st seating for Saturday's playoff round. In the first playoff game on Saturday, the Gators topped Big Ben's high school team Findlay, OH, by the score of 34-25. The Gators then faced Pittsburgh Central Catholic, who they had defeated on Friday (13-12), and topped the Vikings 20-6. In the third round playoff game the Gators defeated Kiski 20-14, to bring on the rematch with PCC in the Championship game. In the championship game, the Gators took the ball first and drove down inside the PCC 5 yardline, where they failed to score and the ball turned over on downs. PCC then took the ball and could not score either. The Gators then drove down field and scored a TD, followed by the conversion for a 7-0 lead. On the first play of the next series for PCC, they threw a 40-yard bomb for a 1 play TD, followed by the conversion for the 7-7 tie. The Gators then drove down field and scored again making the score 14-7. PCC answered with another 1-play drive with another 40 yard bomb, but missed the conversion to make the score 14-13. The Gators then scored again to make the score 21-13, and near the end of the game PCC hit another 40 yard bomb TD but missed the 2 point conversion when a Gator LB picked off the pass in the end zone to make the final score 21-19, and giving the Gators the tournament win. Gateway and the Burrell Bucs worked out together on a beautiful Wednesday night at Gateway's Antimarino stadium. In the first round of varsity 10-play practice, the Gators varsity scored 4 times on Burrell. Burrell then took over on offense and promptly went 0-10 in passing thanks to some tough "D". In other action, the 2nd team took more than 50% of the snaps both on offense and defense. Gateway and Pittsburgh Central Catholic battled in the championship game of the 1st annual Gateway 7-on-7 tournament which also included Yough, Jeanette, Franklin Regional and Brashear. The Gators, who had earlier defeated PCC 7-6 in the tournament, played 24+ minutes of scoreless 7-on-7 play against PCC. The Gators were able to move the ball at will on PCC - getting to the PCC 1 before being stopped and had at least two TD passes dropped in the end zone. The Gators defense stifled PCC - stopping them to only 2 1st downs the entire championship game. PCC QB Sunseri was forced to take at least 7 "sacks" because he could not find an open receiver. The game came down to the last minute when PCC took over after stopping Gateway at the PCC 10. PCC QB Sunseri threw 12 yards for a completion then threw up a pass into the corner of the end zone and the PCC reciever "out-grabbed" the Gateway defender for the score with about 45 seconds left. PCC then ran out the clock before Gateway could try again. The Gators finished the tournament with a record of 6-1. We now have a list (since 2002) of Gateway football players who have played football at the next level, as well as individual accolades. Monroeville's largest employer - Westinghouse, who has been a staple in the community for more than 35 years, has dealt a big blow to Monroeville - and Gateway School District - by deciding to move to Cranberry Township. The big winners - Butler County and Seneca Valley School District, will reap the rewards of a 3,000+ person workforce headed their way by 2009/2010 and taking their $70,000 average salaries with them to Butler county. By leaving the 138 acre campus where many of our mothers, fathers, neighbors and classmates worked, Westinghouse will leave a large void in Monroeville. The repercussions of this decision by Westinghouse not only impacts Monroeville, but also surrounding communities and school districts, such as Churchill, Penn Hills, Plum, Murrysville, Penn Township, and others, where many of the 2,100 Monroeville based employees live.